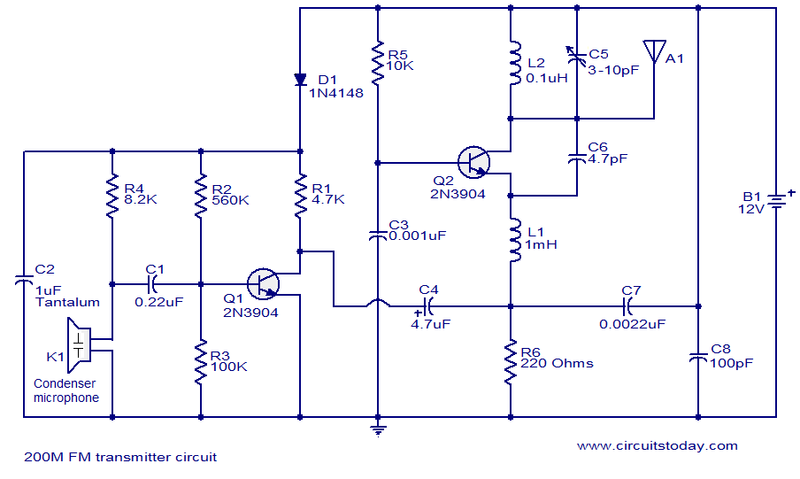 A very stable and simple FM transmitter circuit is given here. With a matching antenna, this transmitter can attain a range of around 200 meters. I assembled this transmitter few years and got very good results. Let us see how the circuit works. A condenser microphone (K1) is used to pick the sound to be transmitted. Capacitor C1 is a DC decoupler and the sound signal is coupled to the base of Q1 which wired as a preamplifier.R2 and R3 are the biasing resistors of Q1. Amplified sound signal will be available at the collector of Q1 and it coupled to the emitter of transistor Q2 through the capacitor C4 and 1mH inductor L1. Capacitor C4 decouples the DC component from the preamplifier output. Q2 performs the job of oscillator and modulator. Inductor L2 and variable capacitor C5 forms the tank circuit necessary for creating oscillations. Capacitor C6 is the feedback capacitor. The modulated FM wave will be available at the collector of Q1 and it is transmitted using the antenna A1. Assembling the circuit on a good PCB will give better results. I used a 12V battery for powering the circuit. A 9V PP3 battery will also do the job. A battery eliminator is also fine but it will induce noise. Antenna A1 can be a 25cm long copper wire. K1 is a condenser microphone. C2 should be a Tantalum capacitor. Variable capacitor C5 can be used to adjust the transmission frequency. This simplified formula will help you in making inductors, L = (dÂ²nÂ²) / (18d+40l). Where L is the inductance of the coil in uH , d is the coil diameter in inches, l is the coil length in inches and n is the number of turns. Just try to make the inductor your self using this formaula. If you can’t, then comment here.I will give you the winding details. hi jacky, thanks for the circuit, the problem with my case is i want to design a fm transmitter and a reciever in the 50 MHZ band since it is allowed for amateur radio users….can u help me on how to build those both and what r the components that i may require? can i send audio signal..with out noice through this? ?and can i have the receiver circuit for this fm transmitter…. i need long range FM transmitter details. hello, it is good a person who enjoy it. sir,hw can i make the inductor coils? pls.reply asap..
hi sir, what is the power requirement of 200 meter fm transmitter? please i need it asap.. thanks sir..
can i use a fixed capacitor of 30pf instead of the variable one so that i could get a fixed frequency of 91.9 MHz, which can be atleast heard over a radio. Please reply me as soon as possible. I am in the mid of my project assignment. i can’t understand L 1 and L 2. please answer me about this. Hi suhail, it is an intresting circuit, most of capacitors can be found in scrap radios like 10band world reciever, coil is 3 to 4 turns #22swg or take it from old fm radio. 1mH coil can get from old tv,vcr,dish reciever..etc. I am facing problems regarding the making of the inductors 0.1uH & 1mH specified in the circuit. Kindly please specify the details, i.e TURNS, LEGTH, DIAMETER & GUAGE OF WIRE. I have bought 24 AWG wire, is it okay?? And also tell me that what range of frequency you had used in your circuit using the tank circuit comprising 0.1uH inductor & 3-10pF capacitor because I have theoretically calculated using the formula ” F = 1/(2*pi*sqrt(L*C))” that the range will be approx 159MHz(for 10pF) to 290MHz(for 3pF) which is beyond the range of commercial FM broadcast band i.e 88MHz to 108MHz. PLEASE REPLY ME AS SOON AS POSSIBLE TO SORT OUT MY PROBLEMS. ITS VERY URGENT. THANK YOU & GOOD NIGHT. L2 should be 3 1/2 turns of 18SWG with an id of 8mm. Coil can be spread or compessed to achieve the broadcast band range. L1 can be standard 1mH choke or honey comb wound 250 turns of silk covered 28 gauge wire on a 3mm former. Since this type of winding will be difficult you can buy a standard one and use it. L2 can be easily wound. add a 10 pf fixed capacitor in parallel with the variable capacitor to bring down the frequency to the required range. Hi, just assemble the circuit and use any of 22,33,47 pf fixed cap and any guage wire between 28 to 20 swg is fine and strech or press the coil to get desired frequency, use variable cap to fine tune. A coupling cap is good for ANT. sir can u pls give me a ciruit for generating radio waves using simple circuits like oscillator and amplifiers at low cost. pls tell as soon as possible. i just want the details of the inductor. Please tell me that where the transmitted signal can be received either fm radio or another receiver circuit for testing and what will be the receiving frequency. Also tell me how we can make the inductor. I built this circuit but i could not get any output from the oscillator. Hey guys . I telling in the basis of i have first in eletronics and working in sony as eletronic expert.this site is cheating u. Ucan do this circiut but wOULD NOT WORK.U CAN DOUBTS. Ucan see the rivews .any get the output of the circiut . Every body’s are not working. As u want good working hobby circiuts . U can purchase “HOBBY ELETRONICS” books from shops .its is more better and good. Don’t spoil ur money and time. Hey guys in the internet so many web site providing hobbycirciut i listened and looked these circiut and it is wrong trust me . I telling in the basis of i have first in eletronics and working in sony as eletronic expert.this site is cheating u. Ucan do this circiut but wOULD NOT WORK.U CAN DOUBTS. Ucan see the rivews .any get the output of the circiut . Every body’s are not working. As u want good working hobby circiuts . U can purchase “HOBBY ELETRONICS” books from shops .its is more better and good. Don’t spoil ur money and time. Could I have a mini jack input on this? is any1 dere..plz yr help out.. fr designing dis ckt in orcad i need the values of transistor , diode, antenna and microphne..just lyk u had provided d values for resistance and capacitor..provide dese values too..!!! hey..dese components of dis transmitter..r so random..wil dese b easily available..!?? Seetharaman sir, I have read all the comments and your respond.before that i bought all the components and made one inductor of 1mh…but…as you replied …to Shine that….L1 should be 1uH (not imH)20 turns of 20SWG (0.9mm dia wire)6mmID covering a length of 20mm…….i tried really hard to built 1 mh’s inductor…..what should i do…i’m using this as my lastyear diploma project..my collage’s project’s sir said to change the project if you are not able to find inductor in a week…and i really want to finish this one…. would you plz help me out. sir, i cant get a stable frequency also cant get clear sound,it is too much noisy. what can i do? Hi, what would happen if the input voltage was increased? Would a greater range be achieved? what would the maximum voltage for this circuit be? we are connecting the circuit in breadboard and using 0.47 micro henry inductor in place of L2. what all changes we should make in the circuit for obtaining a freq between 88-108 MHz? And how to check the output? Hi Shashank Solid Tantalum capacitors are close tolerance (+/- 5% or even better)type and of very low internal leakage current, hence most suitable for timer appliocations. As there is no inductance involed most suited for decoupling in high frequency circuits. Hi Seetharaman. Can we replace tantalum capacitor by any other type? Why don’t you just give the info of the inductors. geez! hi Seetharaman, can we replace Tantalum capacitor by any other type of capacitor? Hi Zain I have not tried, it should work whether it is audio or pulse train. what is frequency of this transmitter??? describe for m how i determine the transmission frequency, and the bandwidth i can use with capacitor C5. Hey. I got the answer from your circuit. The oscillator circuit with feedback condition did not work. I’ve removed c3 parallel with the R5. gud evening seetharaman,can i use d c5 capacitor as fixed capacitor?and have i know between frequancy range in c5? hey seetharaman plz help me with my battery charger circuit using scr. i have left questions on that page. Hi Shine L2 should be 6 turns of 18SWG (1.2mm dia wire)wire air cored ID of 6mm and winding covering a length of 12mm. L1 should be 1uH (not imH)20 turns of 20SWG (0.9mm dia wire)6mmID covering a length of 20mm. how the copper wire used as antenna? as i’m new in electronics i don’t know how to make a inductor. please tell me about this. in addition, what will i mean by SWG? and how many turn needed to make those inductor? Hi Akash the pins which are at 180deg is common that is Vcc and the middle one should get connected to Collector. i complete this design but i m not getting output at proper frequency wt can i do now? my variable capacitor has a 3 terminal which terminal i give to vcc ? Hi Munna the supply voltage 12 volts hence the capacitor w2orking voltage should be greater than that. can 16volt 25volt or even 40volt. Hi Robert wind L2 with 18SWG super enamelled copper wire with 6mm id and 4 turns, windings spaced at dia of wire. The oscillator center frequency will tune around 100MHz. Sir please help me the tips and how i can tune it 88 -108 email. Mugabi103@yahoo.com THANK YOU . I’m not able to make the inductor. I assembled all the parts in PCB accurately but it doesn’t work. What can i do. Please help me. There is no specific volt identified for the capacitors. I don’t understand capacitors of which volt i’ll use for making a FM transmitter. Please help me. Sir, I’m not able to make the inductors ………. can please tell me the exact no. of turns and the diameter of the inductors, especially of the 1mH one! Hi Mike Q1 is the audio amplifier. Q2 is the colpitts oscillator and the oscillator is modulated at the emitter(Q2)with audio and with the passive tank circuit the modulated RF signal is radiated. Thanks Seetharaman It’s a good idea but I’ve another question. Can you explain me why “Q2 performs the job of oscillator and modulator”? I thought that tank circuit is oscillator but Q1 is amplifire so how transistor can create oscillations? Hi Atul 3.9, 5.6 PF can be used here. Hi Mike you can add a 22PF fixed capacitor in parallel with the existing C5. I’d like to have a tramsmitter with a range about 100MHz so may I use 10-30pF variable capacitor to get lower frequencies? plz suggest me anthr capacitor instead of 4.7pf feedback capacitor of T2. Hi Meleja yes with C5 you can set the frequency. How is the frequency set? Is it set via C5? Hi Meleja between 150 and 300MHz. Hi, what frequency does this work at? How find the length of a copper wire by using its weight and diameter…? Hi Gustav if it is readily available please use it. no need to test your patience in winding. please tell me the winding detials. Can I use inductors bought in a an electronic shop or do I have to make it at home? how do i calculate the frequency? i constructed it and it worked but i need to know how to calculate the frequency. i would like to ask is air core inductor a compulsory components? can i use other type of inductor such as coloured-band inductor? i assembled this circuit and i didnt get any output from it. can anyone tell me how to troubleshoot the circuit? Pls. send me the winding details of the antenna for the 200M FM transmitter. Please help me to get the details of winding of inductance coil of .1uH and 1mH. Hi Tyler diode is decoupling audio and rf stage to minimise cross modulation. C8 is the supply decoupling capacitor it can be upto 100nF. What is the purpose of the diode, and c8 in this circuit diagram. I just finished building it and it works great! What is the purpose of the diode? Also what is actually doing the modulating here? I just built it and it works great!!! can you give printed circuit board (pcb) of this circuit? it is very urgent. can you give this circuit’s board design? please. Hi Saad with the given inductor and variable capacitor it will tune between 160 and 300MHz. even i hav the same doubts whch these ppl hav., hw 2 find the freq. of tranmitter? tel me much about designin of inductors.,. ya…. its very interesting.. but at wat frequency i can receive my message..
sir tell me about how many turns required for 1mH & 0.1uH Intductors for 200m fm Transmitteralso about the thickness of wire plssss its very urgent………….plsssss ????????????????????????????? sir can i make that inductor L3 by my own pls suggest…. What is the frequency range? I assume C5 is used to alter this? thank you . kheily khob bood. Could you Plz tell the o/p frequency of the transmitter. i.e. at which frequency I could be able to get the signal in my FM Receiver. good one but i want that winding details….. can u please help me…..